Click to take the Cat Senses Quiz, Pt. 1 and Pt. 2! The cat is known for having amazing senses, and we will start with the hearing. The pinna, the cat's outer ear flap, takes in the sound from all directions, which then goes down the ear canal to the eardrum. After the sound has vibrated on the eardrum, the middle ear with all the tiny bones changes the vibrations to sound waves and sends them to the cochlea and eventually the brain. Because the pinna has 32 muscles that allows it to move 180 degrees, a cat can hear sounds up to five times better in terms of distance than a human. 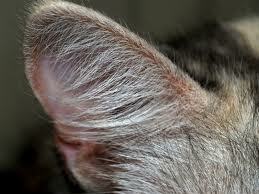 The average cat can hear from 20 hertz up to around 65,000 hertz (some sources say 60,000 htz or 80,000 htz,). Because cats respond more readily to higher pitches than lower pitches, this may be why cats seem to like women better with their high-pitched voice. The ears are also involved with the cat's sense of balance. A reason that cats often land on their feet when they fall is because of a special organ in both of the cat's inner ears called the vestibular apparatus. This organ helps control balance. 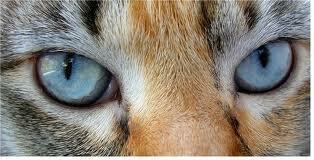 The feline eye structure includes the cornea, the iris, the lens, the retina, and the tapetum lucidum. The cornea is the clear part of the eye in front of the pupil that takes the light and sends it to the lens. The iris is simply the colored part of the eye. Behind the iris, the lens focuses the light image on the retina. The retina, a mass of light-sensitive cells then sends the image to the brain The tapetum lucidum is a thin layer of mirror-like cells behind the retina that reflects any small amount of light, helping the cat to see. This is why cats only need 1/6 as much light as a human needs to see clearly. However, cats cannot see in complete darkness, only in semi-darkness. Cats also have a third eyelid called the haw or nictitating membrane to protect the other parts of the eye. Cat's pupils are elliptical to help control the amount of light that enters. In the dark, the pupils dilate to become almost perfectly round. A cat's pupils can dilate three times more than a human's. A cat's binocular vision is 130 degrees and the peripheral vision is 285 degrees. A human's binocular vision is 120 degrees and his peripheral vision is only 210 degrees. Although it was once believed that cats saw only in black and white, we now know that cats appear to be able to see the colors in the purple, blue, green and yellow ranges. Red, orange, and brown colors appear to be unable to be perceived by cats, and are probably seen as certain shades of gray. Purple, blue, and green are probably seen as the strongest colors by cats. Most blue eyed or odd- eyed white cats are deaf (see the article Cat Coats). Cats rely on their sense of smell to determine where a cat has been, to define their territory, and to find out if food is safe to eat. 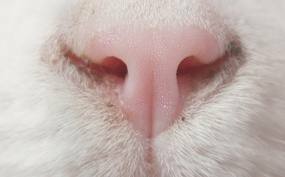 A cat's nose contains around 200 million nerve cells, while a human only has 5 million, making a cat's sense of smell is around 14 times more sensitive than a human's. Not surprisingly, once a cat smells something it may remember it for the rest of its life. The cat also has an unusual organ in the roof of its mouth called the Jacobson's organ (or vomeronasal organ). It helps the cat in the sense of smell and can help distinguish pheremones. The cat draws a scent into it by flehmening, or curling back the upper lip. Each cat has tiny lines running across the nose that is unique to each cat, almost equivalent to a human fingerprint. Many cats love the smell of catnip (see article The Truth About Catnip). Although the cat only has 475 taste buds compared to a humans 9,000, it makes up for it by its unique papillae. The tongue is covered with many small projections called filiform papillae that hook downward, giving the tongue a rough, sand-papery feel (see picture, right). These papillae help them scrape meat off the bone, hold their prey, and groom themselves. Cats have problems tasting sweet and salty food because their taste receptors prefer high-protein and high-fat tastes. With an average of twelve whiskers on each side of the face, these hairs are two to three times thicker and rooted three times deeper than normal hair. 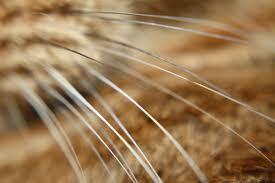 Whiskers, equipped with sensory cells, are so sensitive that they can detect the slightest change in air currents. Whiskers on the face are also used to see if a cat will fit through a gap. Whiskers sometimes fall out, and they are replaced. Not only are whiskers all over the face, but there are also whiskers on the back of the front legs. A cat's fur also has special sensitive nerve ending to detect the slightest touch. A cat's paw is also very sensitive to the touch.